The intention of the Burning Man POWER OF PRAYER project was to create space for the power of prayer at Burning Man. A space for us all to come together in circle with council, storytelling, song, drum, dance, and celebration. We believe thatBurning Man can be platform to amplify the voices of First Nations people, a place to listen to their teachings, celebrate what brings us together as human beings and to raise awareness of indigenous culture. We are profoundly grateful for the beauty, challenges, learning, and the opportunity for positive change. The expression of our collective reverence for Mother Earth at Burning Man was deeply inspiring. We were honored to deepen our relationships with the Paiute and Washoe communities who gave us permission to be guests on their land and who participated with us in prayer. The Power of Prayer was born from a request by the Oceti Sakowin Camp Leadership at Standing Rock to carry the prayers of the Seven Councils Fire to the places we come from and to connect with First Nations in our respective communities. 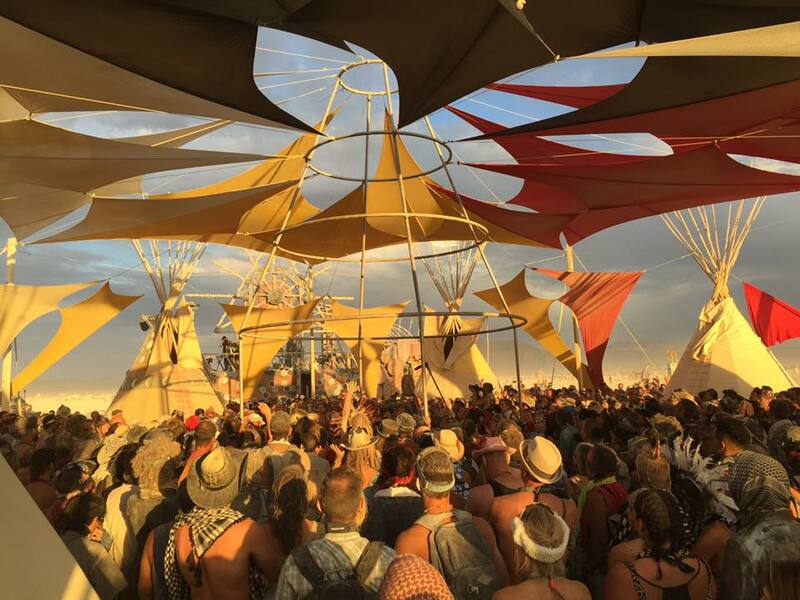 For Burning Man, we were honored to invite our First Nations brothers and sisters to be guests in Red Lightning camp. The project provided support for wisdom keepers coming to the event, including tickets, camp fees, food, accommodations, and travel expenses to and from the event. We would like to clarify that the Unified Global Drum Prayer was not a traditional ceremony, but a drum prayer circle calling for unity. Led by native elders from across Turtle Island and by wisdom keepers from many cultures, the event was incredibly powerful with people from 1,300 locations throughout the world joining in prayer and 520 satellite drum prayer circles happening simultaneously across the globe. We worked to respect First Nation traditions concerning appropriate dress codes and we do not endorse the actions of those present who did not. We cannot take responsibility for everyone’s actions at Burning Man, which is a big and sometimes chaotic event. On that note, people have posted videos on the internet using digital edits that misrepresent the actual events that did take place. We hope that all our participants are conscious that cultural appropriation is not acceptable and we do try our best to raise awareness and understanding of this among all people. We all know that learning how to honor our First Nations brothers and sisters is important. We continue to listen and learn how we can all be more effective allies and expand that awareness through our networks, hometown communities and beyond. Wehold a prayer of unity for all peoples and a return to living in harmony with all our relations. Listening deeply to ancient wisdoms that honor nature and all sentient beings are an important key for our way forward. Let us walk together in love and service and gratitude.